Every Christmas, even since Amber was 11 months old, I've had her make gifts for our close family members. At first it was just Daddy and the grandparents, then we added my sister, then her husband too. Then the cousins when they came along. This year is Amber's 16th Christmas! That's a lot of unique gift ideas to come up with over the years. Admittedly, a couple of the people on the list now get the same (or very similar) gift from Amber every year because it is consumable. However, the grandmas, aunt, cousins and Daddy need unique gift ideas every year. Some years, like this year, we are able to use one idea for many people. 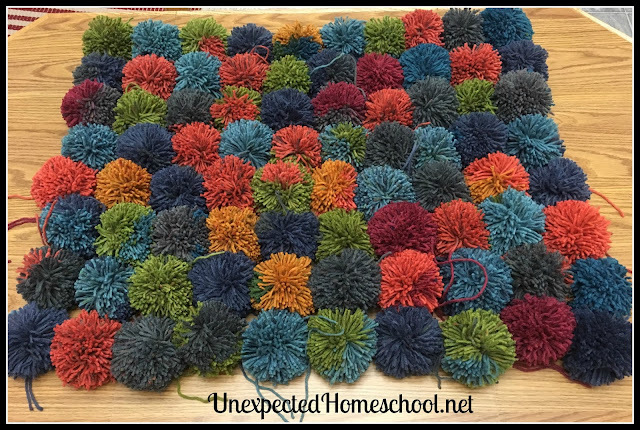 While scouring random yarn craft sites in the early fall, I came upon the idea for a pom-pom rug. I saw several different ideas for the rug, but none exactly fit what we were willing to do. Still, it was a start. We improvised our instructions - because it really couldn't be that hard, right? 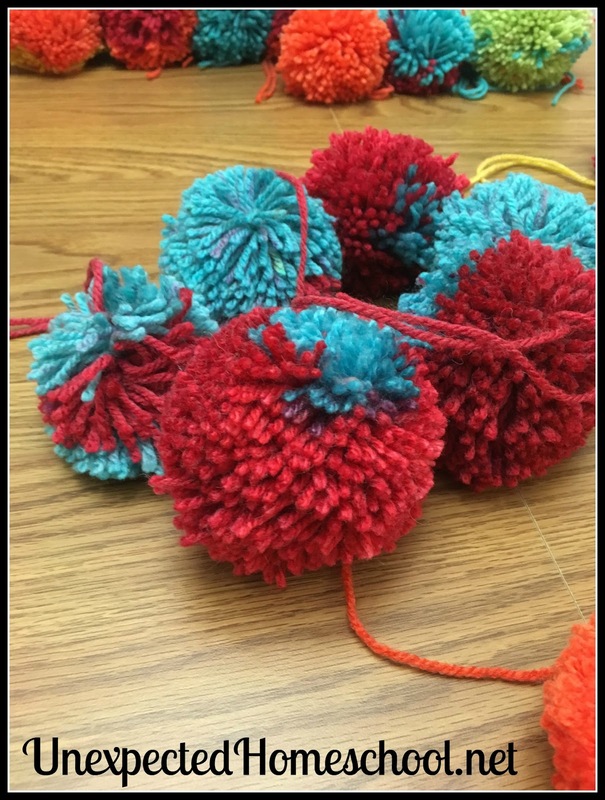 Amber spent a couple of months making pom-poms in the evenings while watching TV. Hundreds upon hundreds of pom-poms. Now don't let that number scare you. She was making five rugs and wanted them all to be a good size too. After looking at yarn in our stash at home and then roaming around Michael's, Amber decided to go with self-striping yarn in order to get a variety of colors in the rugs without needing to select the exact color schemes herself. (She chose Caron Cakes) Of course, you could go with a selection of solid colors too. She is quite enamored with her assortment of solid and multicolored pom-poms that resulted from the color changes. We did decide that veregated yarn didn't have quite the look we wanted. How large do you want your rug? Weight of the yarn used? Amber made rugs that were roughly 24" x 18" (give or take a little bit. 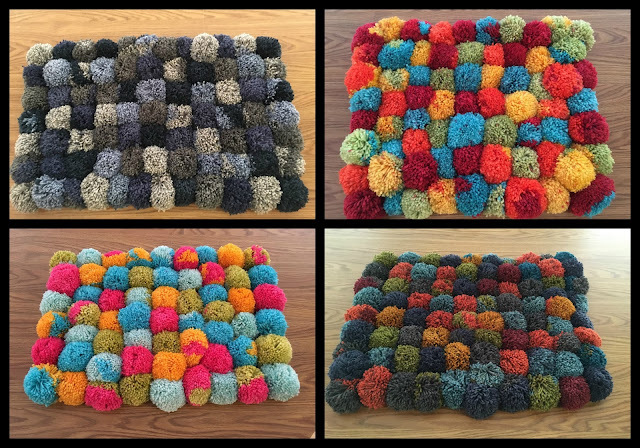 Each rug was custom cut to the number of pom-poms she made). However, the number of pom-poms varied between 65 and 85, depending on the weight of the yarn used. 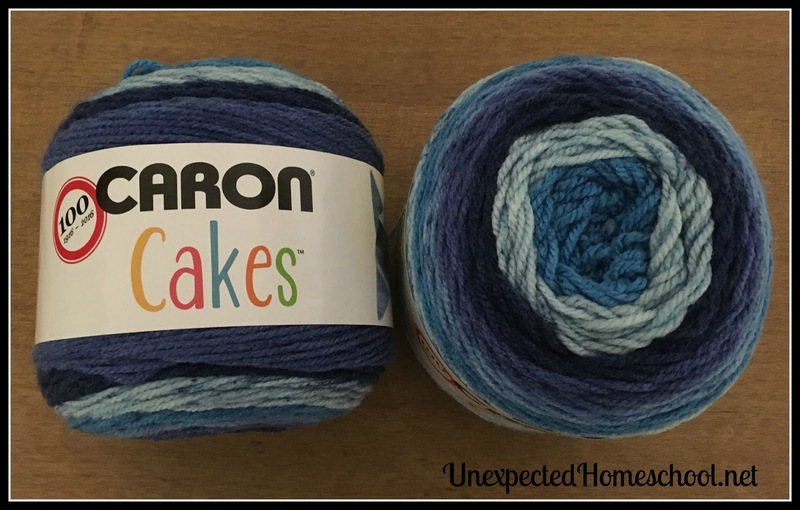 Although she thought she was getting similar yarn for all of the rugs, some of the Caron Cakes she used definitely have a different texture and weight. We did not set out to make a specific size rug, Instead we bought a couple of trial skeins of yarn to see how many pom-poms she could get from those, and how large of a rug it would make. After that we guessed on the amount of yarn needed. In the end and after numerous return trips to Michael's, Amber used 5 skeins of the 383 yd. / 350 m of the Medium Worsted (4) weight Caron Cakes for some of the rugs and 4 skeins of the 603 yd. / 551 m of Medium (4) weight Caron Big Cakes for others. Amber definitely noticed a difference in types of pom-poms the Big Cakes made vs the regular Cakes. She much preferred the regular Caron Cakes, however the colors she wanted for her cousins were only available in the Big Cakes. 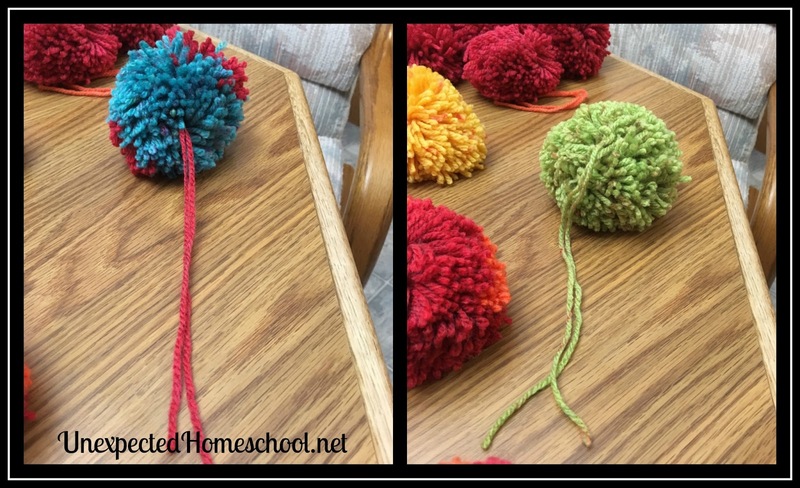 There are numerous ways to make yarn pom-poms, and I'm sure you can look them up online if you've found this blog post. We did look them up and started looking around our house for cardboard to make pom-poms. Realistically, the cardboard pom-pom templates were going to end up destroyed and recreated numerous times given how many pom-poms Amber needed to make. Instead we invested a very small amount of money in the Clover Pom-Pom Maker - it comes with two sizes, although Amber only used the large. Amber had absolutely no issues at all with the Pom-Pom Maker and it was worth the $7.00 we spent to avoid constant degradation of a cardboard template. The only other supply you need is the base of your rug. Conveniently, non-slip rug backing comes in a grid pattern. 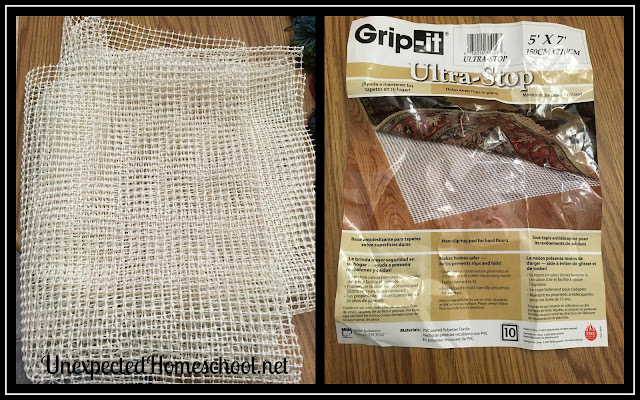 We purchased a large 5'x7' piece of non-slip rug padding on Amazon for $12, which was enough for all five rugs Amber made, with backing to spare. 1. Make your pom-poms. 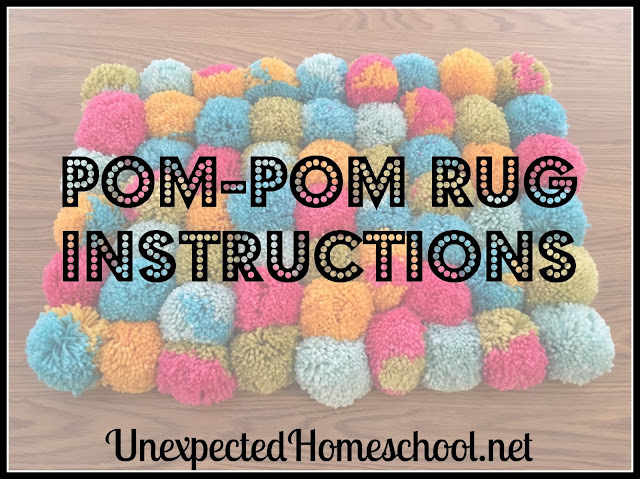 If you're like us, you might make a few to get your sizing down and then guestimate how many pom-poms you will need for your rug. There are too many variables with the yarn for me to tell you the number of pom-poms you might need. 2. When making your pom-poms, leave long the piece of yarn you use to cinch up the pom-pom. At least 3-4 inches for each side of the tail. 3. 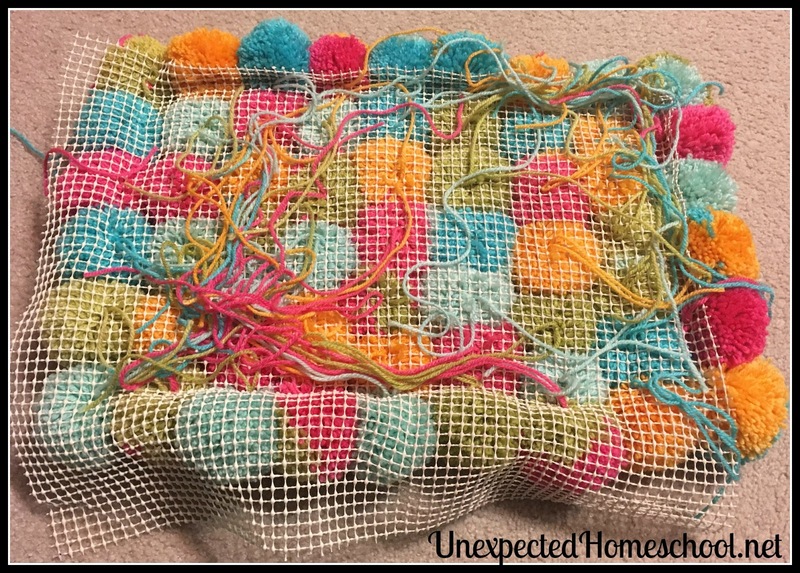 Lay out your finished pom-poms to create the pattern you wish. Remember they will need to be packed fairly close together to make a rug that doesn't separate when standing upon. Pattern planned, and ready to be attached to the backing. 4. Measure the height and length of your pom-poms when you have your pattern finalized. Your rug will be no larger than this size. Generally, we found that we could not keep the pom-poms pushed together as tightly as we wanted during layout, but it was a good estimate of the size. 5. Cut your rug backing to the size measured in step 4. Be careful to keep the grid pattern straight when you cut. It can be disorienting if you try to use a diagonally cut grid pattern. 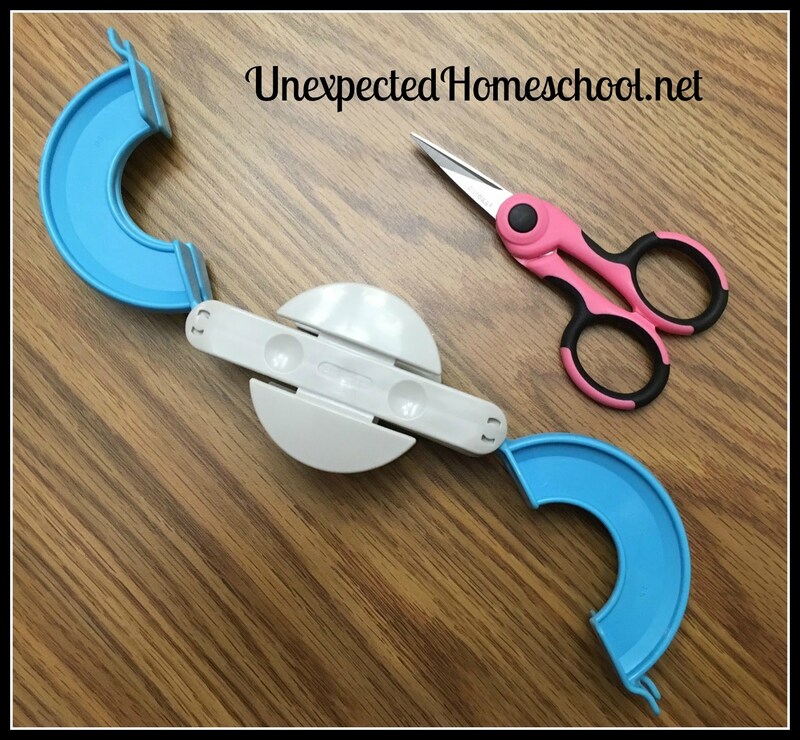 Of course, you can make a rounded rug too, the measuring and cutting is just a little more difficult. 6. Pick a row of your pom-pom rug pattern, and start adding it to the backing. Make sure the gripper side of the backing is facing away from you. 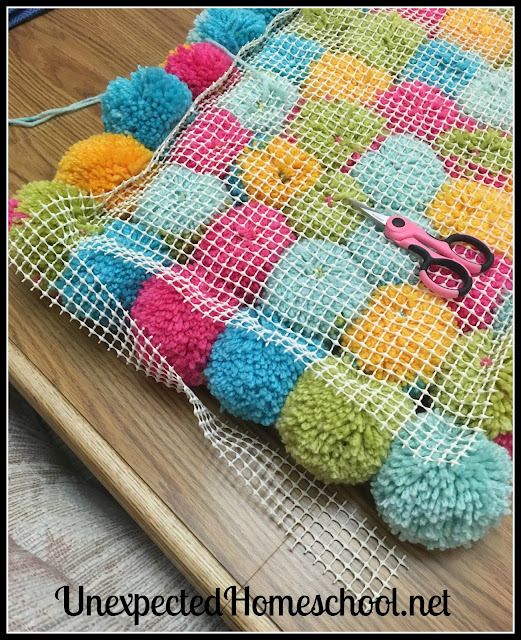 We want to add our pom-poms to the side that would attach to another rug, leaving the gripper side for the floor still. Take those long pom-pom tails and pull them through the grid of the backing and tie it in a couple of knots, leaving the remaining tails loose on the back, for the moment. This allows you to move pom-poms more easily than if you finish it off as you go. It's really up to you at this point if you make the pom-poms line up perfectly or if you have a different number of them in each row. For the majority, we tried to have perfect lines. However, some of the pom-poms were smaller than others and that was leaving gaps in the rug. In those cases we put a couple of the smaller pom-poms together, meaning occasional rows have one more pom-pom than the others. It doesn't have to be perfect. 7. 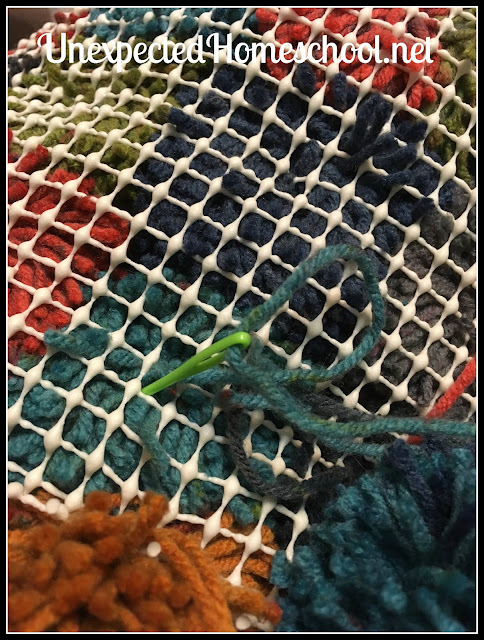 When all of the pom-poms have been anchored onto the backing, using a tapestry needle (I used the big plastic ones that I keep with my crochet) thread each of the long tails up through its pom-pom. You will end up with a very neat looking back side to your rug with the non-stick portion still able to grip the floor. 8. Trim all of the tails that you just pulled through from the back to match the size of their pom-poms. You won't even be able to see them after this step, they should look like part of the pom-pom. 9. Trim any excess backing. And you are finished! Look at the neat back! 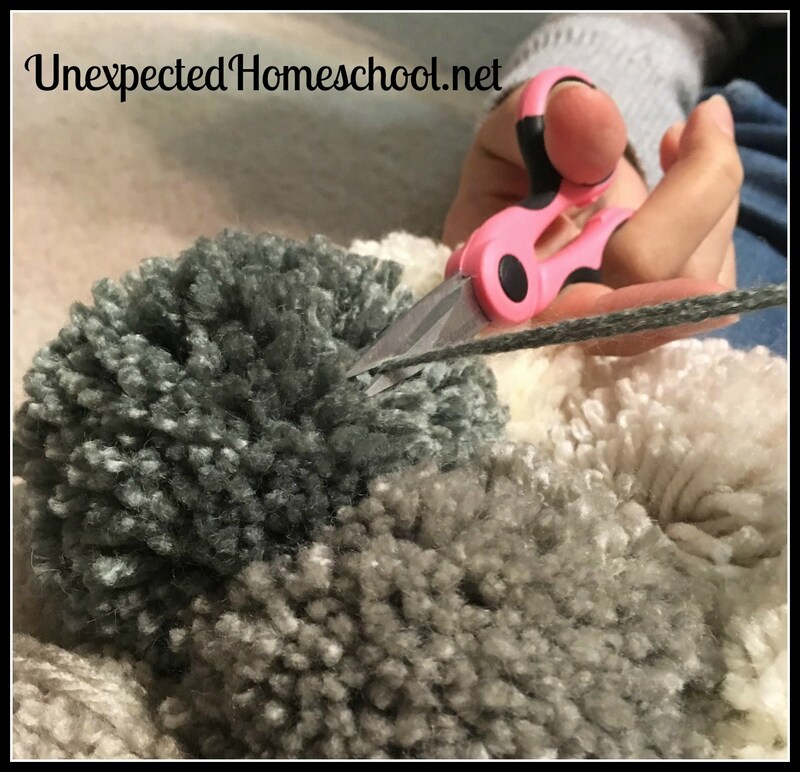 I hope you have as much fun making your pom-pom rug as Amber and I had with these. they look good all jumbled together like that.